Defendant Liu Yuandong, male, born March 30, 1978, ID number 44142419780330****, Han ethnicity, undergraduate university education, place of household registration: Guangdong province, Wuhua county, Shuizhai township neighborhood committee township government dormitory. Criminally detained on March 11, 2013, by Guangzhou Municipality Public Security Bureau Tianhe District Branch on suspicion of capital withdrawal. On April 3, 2013, the Tianhe District People’s Procuratorate approved the the arrest of the defendant, who was arrested on April 4 of the same year by Guangzhou Municipality Public Security Bureau Tianhe District Branch. Defendant Yang Jinghu, male, born July 14, 1973, ID number 44082419730714****, Han ethnicity, undergraduate university education, place of household registration: Apt. 2504, No. 34 Jinhengbei first street, Haizhu District, Guangzhou Municipality. Criminally detained on March 1, 2013, by Guangzhou Municipality Public Security Bureau Tianhe District Branch on suspicion of capital withdrawal. On April 3, 2013, the Tianhe District People’s Procuratorate approved the arrest of the defendant who was arrested on April 4 of the same year by Guangzhou Municipality Public Security Bureau Tianhe District Branch. Guangzhou Municipality Public Security Bureau Tianhe District Branch has concluded its investigation of the case. On June 3, 2013, the case was transferred to this Procuratorate for reviewing and indicting Liu Yuandong and Yang Jinghu on suspicion of false capital contribution; on November 27, 2013, Guangzhou PSB Tianhe District Branch submitted to this Procuratorate supplementary materials for reviewing and indicting Liu Yuandong on suspicion of gathering a crowd to disrupt order in a public place. Upon accepting the case, this Procuratorate notified the defendants of their rights to counsel and the victims of their rights to engage agent(s) ad litem. This Procuratorate questioned the defendants in accordance with the law, and examined the case materials in their entirety. During this process, this Procuratorate twice returned the case to Guangzhou PSB Tianhe District Branch for additional investigation, and extended the review period three times. Liu Yuandong (刘远东) gave a speech outside Southern Weekend building in January, 2013. On January 7, 2013, defendant Liu Yuandong went to the entrance area of the Southern Media Group at No. 289 Guangzhou Avenue, Middle Section. By holding up signs and giving speeches, the defendant attracted a large number of onlookers, and gathered a crowd to disrupt order in a public place. At the peak point, the crowd was a few hundred people, also obstructed police officers to enforce law, and seriously disrupted order in a public place. The same evening, Liu Yuandong contacted Yu Gang and others and gathered others to take part in the illegal assembly later at the same location. On January 8, 2013, Yu Gang and others, upon invitation, went to the aforementioned location where they held up signs, gave speeches, and took group photos, disrupting order in a public place. 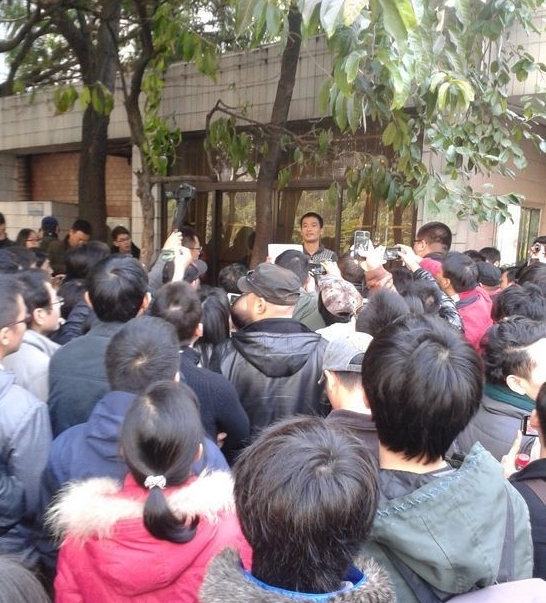 On January 9 the same year, defendant Liu Yuandong once again went to the aforementioned location, and gathered a crowd and disrupted order in a public place in the same manner. Between November and December, 2011, defendant Liu Yuandong, without actually providing any capital, consulted with defendant Yang Jinghu, who was the legal representative of Guangzhou Sanji Financial Consultancy Co. Ltd. (hereafter referred to as “Sanji Co.”) and agreed that, defendant Liu Yuandong would pay a service fee of RMB 6,800, and Sanji Co. would apply and register with Guangzhou Municipality Administration Bureau for Industry and Commerce on his behalf to establish the Guangdong Yuan’ao Biological Technology Co. Ltd. (hereafter referred to as Yaun’ao Co.) with a registered capital of RMB 500,000. Then, Sanji Co. first provided RMB 30,000 as Yuan’ao Co.’s registered capital, later applied to increase the capital to RMB 500,000. After the aforementioned company was verified and approved for registration, and issued business license, by the registration organ, Sanji Co. withdrew the registered capital of RMB 500,000 it had provided as a service. Between November and December, 2011, Hu Shaogeng (胡绍耿, handled in a separate case), without actually providing any capital, consulted with defendant Yang Jinghu, who was the legal representative of Guangzhou Sanji Financial Consultancy Co. Ltd. (hereafter referred to as “Sanji Co.”) and agreed that, defendant Hu Shaogeng would pay a service fee of RMB 8,500, and Sanji Co. would apply and register with Guangzhou Municipality Administration Bureau for Industry and Commerce on his behalf to establish the Guangzhou Xinrui Photography Co. Ltd. (hereafter referred to as Xinrui Co.) with a registered capital of RMB 1,000,000. Then, Sanji Co. provided RMB 1,000,000 as Xinrui’ao Co.’s registered capital. After the aforementioned company was verified and approved for registration, and issued a business license by the registration organ, Sanji Co. withdrew the registered capital of RMB 1,000,000 it had provided as a service. On March 1, 2013, defendant Yang Jinghu was taken into custody; on March 11 the same year, defendant Liu Yuandong was taken into custody. 2. Witness testimonies by Li Chuang, Huang Pinqian, Huang Huijie, Luo Shan, Yu Gang, Chen Jinyang, Zhang Tichao, Yang Huiqing, Cai Lufeng, Lin Qingya, Mai Yuejiao, Hu Shaogeng, and identification records. This Procuratorate believes that defendant Liu Yuandong and Yang Jinghu disregarded the country’s law, used fraudulent means to falsify registered capital when applying for and registering a company, and cheated the government registration organ to obtain company registration. The amount of money involved was huge, and their behaviors have jointly violated Article 158 of the Criminal Law of the People’s Republic of China, the criminal facts are clear and evidence conclusive and sufficient, and the defendants should be prosecuted for the crime of false declaration of registered capital. Defendant Liu Yuandong disregarded the country’s law, and gathered a crowd to disrupt order in a public place. The circumstances are serious, and he qualifies as a ringleader. His acts constitute a violation of the provisions of Article 291 of the Criminal Law of the PRC. The facts of his crimes are clear, and the evidence conclusive and sufficient; the defendant should be prosecuted for the crime of gathering a crowd to disrupt the order of a public place. Defendant Liu Yuandong committed multiple crimes and, according to Article 69 of the Criminal Law of the PRC, he shall be given combined punishment. In accordance with Article 172 of the Criminal Procedure Law of the PRC, we hereby issue this indictment and request punishment in accordance with the law. 1. Defendants Liu Yuandong, Yang Jinghu are currently detained in Guangzhou Municipality Tianhe Detention Center. 2. Total 12 volumes of case documentation, evident and supplementary investigation, and 5 compact discs. By China Change in Reports, Rule of Law on December 29, 2013 .